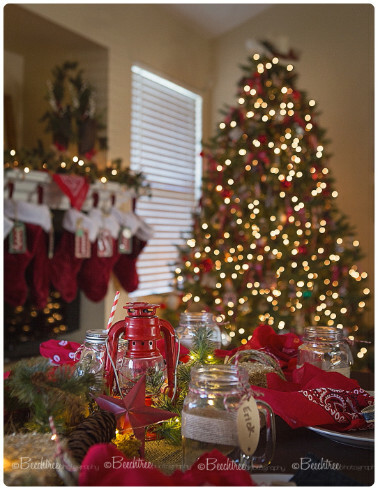 Posts with tag: "Cowboy Christmas"
Welcome to BeechTree Photography's Blog! Thank you for taking the time to stop by! Scroll through and take a peek into the stories behind the images. Come back often. See the latest sessions, plus and little of this and a little of that. Enjoy and feel free to share on your favorite social media! One of my great pleasures of the holiday season is my annual tablescape theme. It differs from year to year and is always a surprise for my family when they arrive to celebrate the holidays. This year it was a Cowboy Christmas. Red bandanas, mini hay bales, lanterns and denim and rope. From the Cowgirl hat topper on the tree, to the mason jar mugs, it was a Christmas fit for a buckaroo! My favorite part were the ornaments I made this year, and the jean pocket "gift wrapping". Take a peek!